Food for thought! : Leadership is one of the most enduring human responsibilities. Captains should have a vision, inspire action and lead from the front. If you do an in-depth study of leadership, the first and key principle of leadership or captaincy, is the good relationship you maintain with your team. Once, the Bill Bradley, senator and a fine American Basket-ball player mentioned: “Leadership is unlocking people’s potential to become better”. A good cricket captain’s role is to get the best out of his team. He must lead in front. The first milestone on the journey to leadership not only demands leaders or captains to be credible, but also, they be forward looking. They have a sense of direction and a vision for the future. A cricket captain, you must be disciplined, committed, pleasant, charming and should always maintain a very high Public Relation or function and a disciplined high code of conduct on and off the field. He must get an example to others. Ornament to cricket: Out of the Sri Lankan Cricket captains, Ranjan Senerath Medugalle is outstanding and I consider him an ornament to cricket. Today, he is the number one, highest respected Elite Match Refree in the world. Ranjan Madugalle, even after his playing days, brought credit and honour toSri Lanka. The main reason is his behaviour, his charismatic, attractive personality. 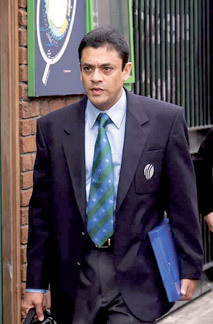 His exemplary behaviour is hailed very high in ICC and the entire cricketing fraternity. Added to all this, he is a brilliant speaker, orator, who can address any forum. Added to all this, he is methodical, meticulous, pleasant and Charismatic and charming. He is a fine conversationalist, a man with a golden heart. He is with full of humour. Ranjan Madugalle hails from a highly respectable family fromKandy. His father Lionel Madugalle, was graduate from theuniversityofCeylon. He served as a highly respected secretary of the sports Ministry, for many years. If my memory serves right. He served under the dynamic Minister of Sports late K. B. Ratnayake. They ushered a golden era in sports inSri Lanka. Ranjan Madugalle was born on April 22, 1959 inKandy. He had his early education at one of the leading Anglican schools in the countryTrinityCollege,Kandy. Later, he joinedRoyalCollege,Colombo. He was an outstanding schoolboy cricketer atRoyalCollege. He played junior cricket at Royal and graduated to play forRoyalCollege. A brief history of Royal-Thomian: Royal-Thomian big matchBattleof the Blues, was started in the year 1880. At that time Royal was known as “Academy”. The first match was played at Galle Face on 29th and 30th October 1880. Academy (Royal) was captained by J. W. De Silva and S’Thomas College, Mutwal was captained by F. W. Mc Donnell. The Academy scored 110 in the first innings and in the second essay collected 35 runs. Tomians scored 59 and 24 respectively. Academy (Royal) won the first Big Match by 62 runs.For any Royalist or a Thomian, the pinnacle in their school cricket career is to represent their respective school in the Big-Match and obtained cricket colours Blue-Gold-Blue (Royal) and Blue-Black Blue (S’Thomas). This historic Big Matc is supposed to be the second oldest school cricket encounter in the world. It was played un-interrupted from 1880 to 2011, so far it will continue in the years to come. the Royal-Thomian Big-Match is one of the most important “Mega Sporting events in theSri Lankasporting calendar.” The Governor-General or Presidents, Prime Ministers will normally grace this Big sporting event. When I spoke to some of the top cricketers who played in Royal-Thomian Encounters, they expressed their views stating it was a day to remember. For any Royalist or a Thomian, the pinnacle in their school cricket career is to represent their respective school in the Big-Match and obtained cricket colours Blue-Gold-Blue (Royal) and Blue-Black Blue (S’Thomas). Five Royal-Thomian Matches: In 1975, playing under P. N. S. Kariyavasam in 96th Royal-Thomian, Ranjan Madugalle scored 4 (run out) in the first innings and captured 2 wickets of M. De Silva (33) and L. W. Ratnayake (28) – His figures – 14-2-32-2. In the 97th Match, he played under T. M. S. Saldin, scored 26 and 71 respectively. In bowling he bowled 3 overs with 1 maiden captured one wicket. In the 98th match against STC he played under S. A. Jayawickrema. Madugalle scored 35 and 46 respectively. In bowling he returned the figures of 12-3-2-27-2.The 99th Royal-Thomian, was captained by Ranjan Madugalle and D. K. Supremaniam captained. In the first innings Ranjan scored 52 and 36 n.o. Ranjan Madugalle had the proud distinction of captaining the three Day centenary Royal-Thomian played at the picturesque S.S.C. Grounds – Lords of Sri Lanka on 8,9,10 March 1979. Thomian skipper was J. D. Pieris. 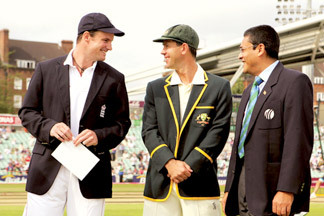 As this centenary Match is so important I give below the Two Teams, according to the batting order. S. Thomas’ — S. P. Wijesinghe, R. Anthonisz, L. De. Zoysa, R. G. De Alwis, J. D. Pieris (Captain), K. De. Alwis, A. Amarasekera, U. Idippily, M. Halangoda, C. P. Richards, L. Seneviratne. Royal — H. Musafer, C. P. Fernando, R. S. Madugalle (Captain), S Pasqual, P. G. S. Kariyawasam, R. Jurangpathy, A. De Mel, M. N. Perera, A. De Alwis, R. Wijetunga, K. De Costa. In the centenary match, S’Thomas scored 154 and Royal replied with 321 for 8 declared. Thomians had a deficit of 167 runs. On the final third day, at one stage Thomians were 137 for 7. The 8th wickets fell at 161. Royalist were preparing for a victory celebration. Royal’s greatest old boy, J. R. Jayawardene, who played in the 46th Battle of the Blues on 18th and 19th March 1925, scoring a Golden Duck bowled by C. S. Ratwatta, rushed to the SSC grounds by 2.45 p.m. as the President of Sri Lanka, to join the Royal victory celebrations. Rescue Act: M. Halangoda (70 n.o.) C. P. Richards (20), showed to the world what Thomian Grit is all about. They launched the biggest “Rescue Act” to save S. Thomas’ in this series and remained unbeaten with a fighting, courageous partnership of 97 runs. Royal tried 7 bowlers – A. De. Mel, R. Wijetunga, S. Pasqual, A. De Alwis, R. De Costa, H. Musafer, P. G. S. Kariawasam but Halangoda and Richards were like Horatius’” defending the River Tiber. Thomian spoiled the party: Thomians not only spoiled President Jayawardene’s. “Afternoon Nap” as well the Royal celebrating party. This partnership will go down in the history of Royal Thomians the best face saving partnership, in the series. The unassuming Ranjan once told me, his biggest regret in his cricketing life was the centenary Royal-Thomian, where he could not bring victory to Royal. It was so near, but yet so far. That’s how the game goes, stated Ranjan Madugalle. In Five Royal-Thomians, Ranjan Madugalle had an aggregate of 328 runs. After leavingRoyalCollegeafter a distinguished career, he joined the Ceylon Tobacco Company and retired few years back, as a Top Executive. This elegant right hand batting artist played club cricket representing the Nondescript Cricket Club, ‘NCC’. He played in the First official Test. ROYAL: H. Musafer, C. P. Fernando, R. S. Madugalle (Captain), S Pasqual, P. G. S. Kariyawasam, R. Jurangpathy, A. De Mel, M. N. Perera, A. De Alwis, R. Wijetunga, K. De Costa. In the centenary match, S’Thomas scored 154 and Royal replied with 321 for 8 declared. Thomians had a deficit of 167 runs. On the final third day, at one stage Thomians were 137 for 7. The 8th wickets fell at 161. Royalist were preparing for a victory celebration. Royal’s greatest old boy, J. R. Jayawardene, who played in the 46th Battle of the Blues on 18th and 19th March 1925, scoring a Golden Duck bowled by C. S. Ratwatta, rushed to the SSC grounds by 2.45 p.m. as the President of Sri Lanka, to join the Royal victory celebrations. “Rescue Act” to save S. Thomas’ in this series and remained unbeaten with a fighting, courageous partnership of 97 runs. Royal tried 7 bowlers – A. De. Mel, R. Wijetunga, S. Pasqual, A. De Alwis, R. De Costa, H. Musafer, P. G. S. Kariawasam but Halangoda and Richards were like Horatius’” defending the River Tiber. Thomian spoiled the party: Thomians not only spoiled President Jayawardene’s. “Afternoon Nap” as well the Royal celebrating party. This partnership will go down in the history of Royal Thomians the best face saving partnership, in the series. The unassuming Ranjan once told me, his biggest regret in his cricketing life was the centenary Royal-Thomian, where he could not bring victory to Royal. It was so near, but yet so far. That’s how the game goes, stated Ranjan Madugalle. In Five Royal-Thomians, Ranjan Madugalle had an aggregate of 328 runs. After leaving RoyalCollege after a distinguished career, he joined the Ceylon Tobacco Company and retired few years back, as a Top Executive. This elegant right hand batting artist played club cricket representing the Nondescript Cricket Club, ‘NCC’. He played in the First official Test.